Founded in 1880, QST is the world’s leading supplier of garment components serving the apparel industry on a global scale with manufacturing plants and distribution centers all over the world. 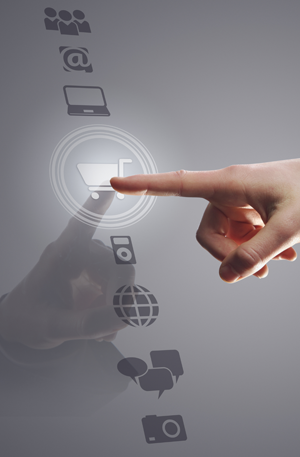 The overall objective is to develop an interactive online design tool to allow QST customers to construct waistband right on the screen. 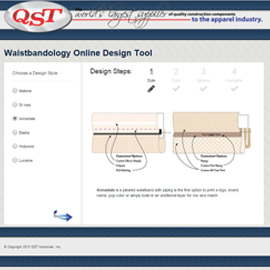 The purpose of the new online waistband design tool was to replace QST’s online waistband brochure and give its customers the capability of designing waistbands online and notifying QST with the design. ISC developed an interactive web application that provided the elements necessary for waistband design. The result is a design canvas which allowed users to pick and choose waistband elements by dragging them on to the canvas area and virtually construct a waistband. This allowed QST customers to get visual confirmation of their design and send the constructed design to QST via email as an attachment.